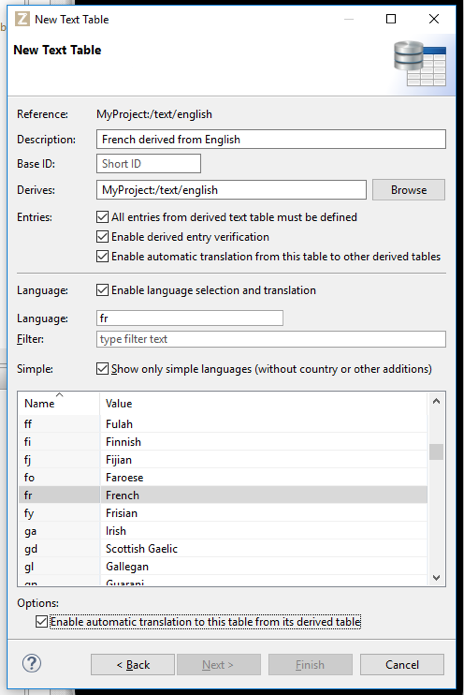 The following description will show you how to create a base table (mother-tongue) for English, and how to configure your text for automatic translation to French, German and Swedish. The first page of the wizard has been filled-in specifying the name ‘english’ for the Text table. Now you can create three additional Text tables and name them french, german and swedish respectively. 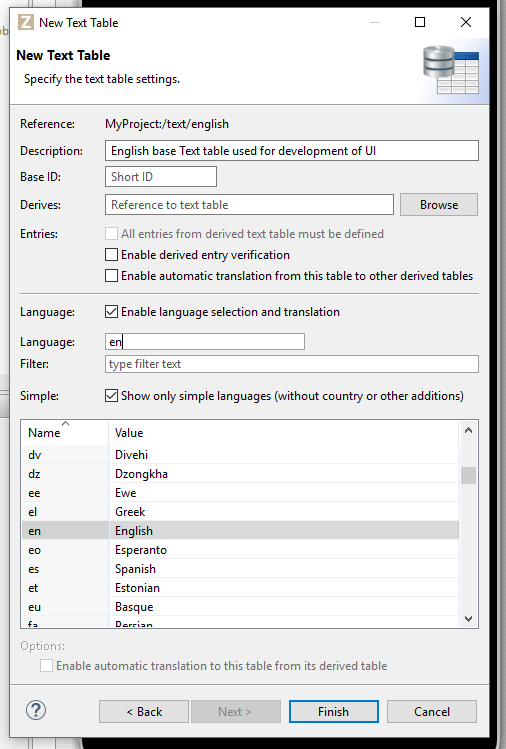 Once all are created, open the Text table editor for the english table and click on the view icon. 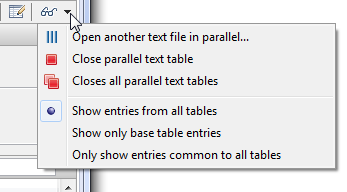 By selecting ‘Open another text file in parallel’, and selecting your french, german and swedish Text tables, all Text tables will be displayed in the same editor. This allows all text entries to be edited from a single point, with visual cues concerning the automatic translation. The Text table editor works in two modes. The recommended way shown above offers clear visibility the text entry. Alternatively, the editor can be toggled to in-place editing to work directly in the table cells. When in-place editing is active, you can also double-click on a tag in the entry field to bring up the dialog for prompting. The in-place editing mode removes the top part of the editor to make room for additional text entries. In the example above for the text-ID “1”, the HTML text will also be placed into language translation while keeping HTML tags in correct locations. This is achieved with Bing and Google translation; other translation engines may not handle it. The top part of the Text table editor has a larger entry field for text input. It parses the entry text depending on its type, and shows problems for invalid tags. Use the tooltip to display any error description. The above example offers an overview of what can be accomplished with Text tables and quick language translation for a world-ready app. The challenges presented by a multi-language user-interface are not limited to language translation but include complications in layout, font choices and cultural conventions. The use of separate dedicated Panels with unique Selectors for special language needs is recommended in iiziGo to accommodate Non-Latin Script Languages and right to left text. The iiziGo platform offers several out-of-the-box features to facilitate the work flow for building your international software.